Please call 812-855-8810 to place your order. You may also reach us by email at spiced@indiana.edu. A shortbread dough cookie hand-dipped in chocolate and vanilla. 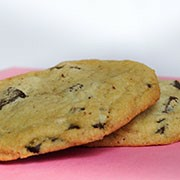 Sugar and Spice Chocolate Chunk Cookie is loaded with just the right amount of cookie dough and rich semi-sweet chocolate chunk pieces. The soft center with the slightest crisp at the edge lends out taste buds to grab the milk and enjoy an American tradition. Chocolate Chunk Cookie Cake with Iced Border. Serves 10–12 people. If you like the combination of peanut butter and chocolate, this is your cookie! 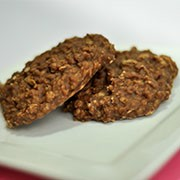 Bittersweet chocolate, oats, and peanut butter, combined to make one of our favorite cookies. 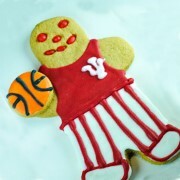 The tastiest way to show your love for Indiana basketball. We took our signature gingerbread people and dressed them up for game day—complete with icing candy-stripe pants. 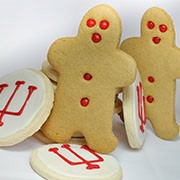 At IU, we love gingerbread. Our Gingerbread People have become a staple at the Sugar and Spice Bakery. Ginger boys or girls come in two sizes and decorations. The Cinnamon, Clove, and Ginger Cookie cut out is dressed with candy red hots. 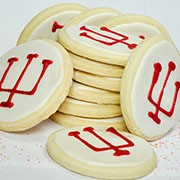 Our Traditional Iced Sugar cookies feature a white background with red IU letters or the red IU trident. Customized colors, designs, and shapes are available. With border and inscription. Serves 10–12. Chocolate chips, M&M's, oats, and peanut butter—the best all-around cookie has everything one could ask for in a cookie and more. 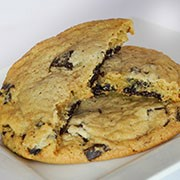 It’s a monster-sized cookie. Our version of the classic—fresh, chewy, and (a lot of) marshmallow goodness. 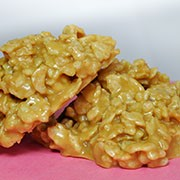 Special K cereal and peanut butter, melted into a chewy cluster of goodness. 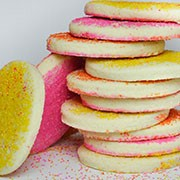 Our hand-rolled Sugar Cookie is a favorite at IU. The sanding sugar for our sprinkled sugar comes in various bright colors, such as blue, dark purple, lime green, orange, red, and yellow. Oversized Sprinkled Sugar Cookie Cake. Serves 10-12 people. Classic Cakes are the pride and joy of Sugar and Spice. Each cake is specially made to fit each order and comes in a variety of ways to make them your own. For convenience, you can choose to have your cake delivered locally, or pick it up at the store. All specialty cakes come with the bottom and top borders, flowers, and an inscription. *Cake orders will not be finalized until your order is confirmed by one of our bakery staff. Cupcakes are available in a variety of flavors, including chocolate, red velvet, seasonal flavors, and vanilla with two types of icing: chocolate or vanilla. Cupcakes are pickup or local delivery only. Wells Cake was a favorite of beloved IU President Herman B Wells and was often requested for his dinner parties and celebrations. Famous for its light and refreshing qualities, Wells Cakes are made with bananas, fresh strawberries, layers of vanilla cake, and whipped cream icing. Wells Cakes are for local pickup or delivery only. Cake orders will not be finalized until your order is confirmed by one of our bakery staff. If you have any questions, please call 812-855-8810. For customized wedding cakes please contact us at 812-855-8810. Red and gold caramel popcorn drizzled with white chocolate, and topped with red milk chocolate candy pieces. Caramel popcorn with a milk chocolate drizzle. Choose your favorite popcorn flavors. Choose your favorite gourmet popcorn plus half a dozen customized Sugar and Spice Traditional Sugar Cookies. Three bags of your favorite gourmet popcorn plus half a dozen customized Sugar and Spice Traditional Sugar Cookies. Choose two flavors of your favorite gourmet popcorn plus one and a half dozen of your favorite Sugar and Spice Traditional Sugar Cookies. A healthy option for the mindful sweet tooth. Everything you need to make it through Dead Week and Finals! Start their year off right with a care package delivered in late August. The Winter Exams Survival Basket, delivered in December and safely before your student's first round of exams. Show your new or returning college student you love and miss them with our new Sugar and Spice Sweet Surprise Care Packages! 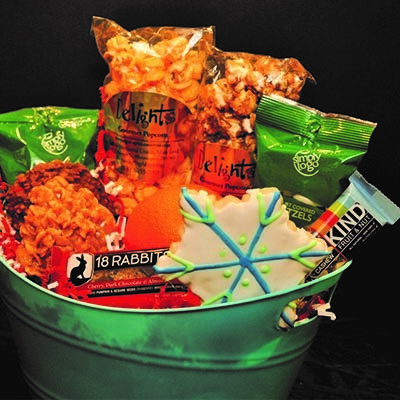 We'll automatically send them different baskets throughout the year that are packed with classic cookies from Sugar and Spice, gourmet popcorn, and other awesome drinks and snacks. They will also receive coupons in each basket that can be redeemed for cookies or specialty drinks made fresh at Sugar and Spice, as well as popcorn and blended smoothies from The Chocolate Moose. 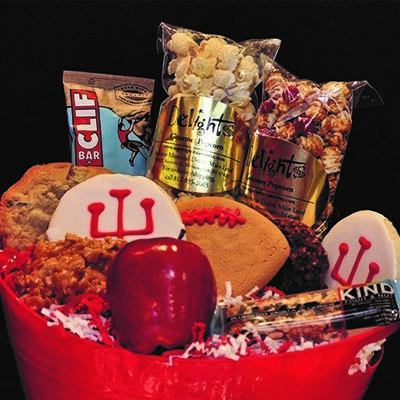 Throughout the year, your student will receive comforting and exciting treats. Regardless of your schedule, your student will know they in your thoughts. Delivered in May before Finals Week. Everything you need to make it through your exams. Delivered in December before finals week or in May before finals week. Add Additional Baskets for care packages throughout the year! Ordering all six baskets qualifies for free local delivery on all basket shipments. All oversized orders—either by size or by weight—must be quoted by our sales representative. Note: We only ship cookies. All delivery days refer to business days—Monday through Friday, excluding holidays. Standard shipping charges cover the costs incurred to prepare, process, and transport your order. Standard rates are based on UPS Ground Delivery within the continental United States. Other delivery methods are available but must be quoted for each order. We ship to most areas outside of the continental United States. Shipping charges vary by destination. When placing your order, please ask about shipping charges. We are unable to ship to P.O. boxes and APO addresses via UPS. UPS will deliver approximately between 8 a.m. until 8 p.m. (extended times may apply during the holidays). If you must have your gift delivered on a specific date, we suggest the use of overnight delivery to guarantee the delivery date. Please check your address information carefully. We cannot extend our guarantee to orders with incorrect addresses. Areas impacted by extreme weather conditions may result in a delay in delivery. We thank you in advance for your understanding during these rare instances. Any package unable for delivery due to incorrect information, untimely picked up by the recipient or when the recipient is no longer at the given address, which is then returned to Sugar and Spice, will not be refunded and will only be reshipped at the customer's cost and request. Regarding untimely pickups: UPS will deliver the package at the delivery address without a signature unless the driver determines that the location is not sufficiently secure. If this happens, UPS will attempt to make a delivery up to three times. On the third attempt, a notice will be left for the recipient to pick up the package at a designated UPS depot. If delivery does not happen after these attempts are made, the perishable package will be sent back to Sugar and Spice. Due to the abundance of holiday orders between November 15 and December 24: Orders must be placed at least five business days in advance to assure on-time delivery. During this period, orders over 10 items must be placed at a minimum of seven business days beforehand.